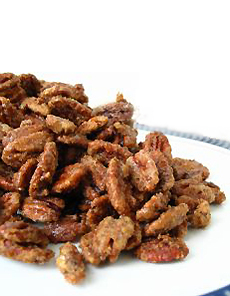 Candied or caramelized pecans. Photo by Daniel West | SXC. As garnish for cakes, cupcakes, puddings, ice cream and other treats. In salads with goat cheese and blue cheese. As sides with coffee, tea and hot chocolate. As gifts, in a small tin, plastic container or cellophane bag tied with ribbon. It is best to make these in small batches to ensure that the nuts are thoroughly coated. ADD the sugar, stirring constantly until it dissolves. Do not allow the mixture to burn. POUR the nuts onto a sheet of aluminum foil and let cool, about 15 minutes. Store up to 2 days in an airtight container.